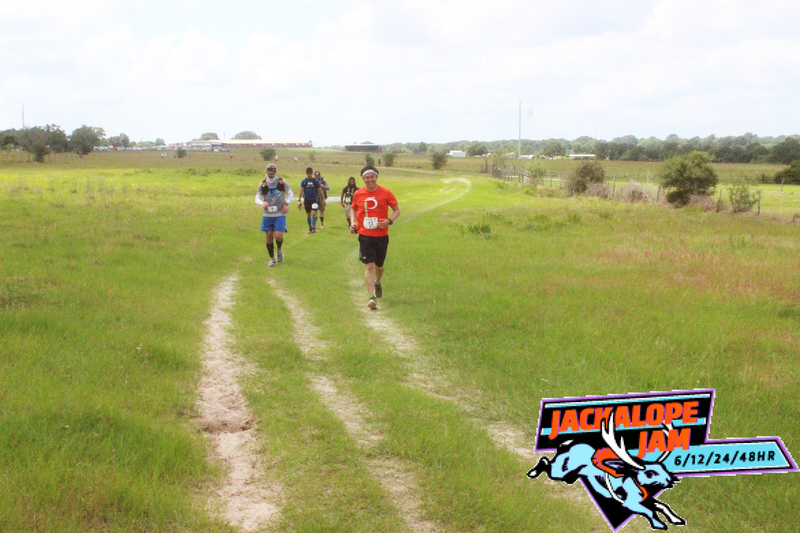 From April 21 to 23 of 2017, after two years of daily debating whether or not I should, I finally set out to turn my fantasy of running 100 miles into a reality at the Jackalope Jam 48-Hour in Cat Spring, Texas. I would be covering a single-mile trail loop, 0.5 mile out and 0.5 mile back, as many times as I can within the given time frame. 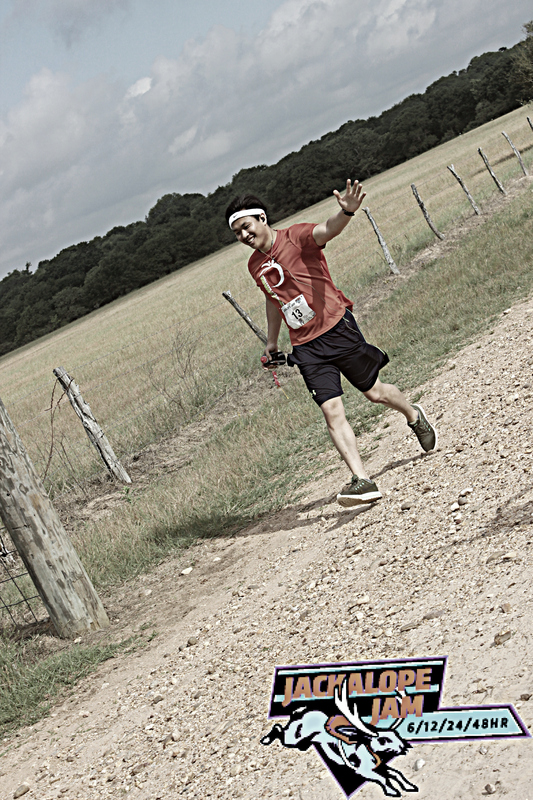 With only two ultramarathons, 51 miles and 50K, under my belt, I relied solely on my Father to control my pace and condition to radiate His presence through me. My objective of reaching the pinnacle of ultrarunning had recently shifted from a simple human desire to building an eternal testimony to His greatness, that in Him, I (we) can do all things; “This only means a lot to me if You do it with me. Allow me to use this journey as a testament to Your greatness for the rest of my life,” I prayed. The Holy Spirit had already repeatedly provided me with motivating verses in the Bible and sermons from my church for the race of my life, and, the day before the event, I was led to Deuteronomy 29:5-6: “Yet the Lord says, ‘During the forty years that I led you through the wilderness, your clothes did not wear out, nor did the sandals on your feet … I did this so that you might know that I am the Lord your God.’ ” I replied, “I know You are the Lord my God, but let others see that through my journey.” Thinking of what happened to Peter walking on water the second he doubted, I reminded myself to always keep the faith. I believed He had already delivered 100 miles into my hands; otherwise, He would not have sent me for this task. 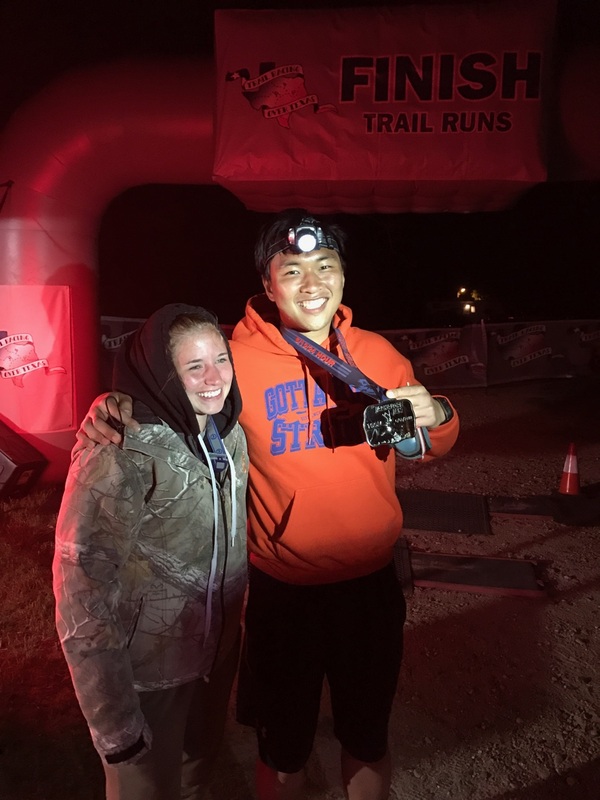 Around mile 75, when the sun had risen again and 24-hour, 12-hour, and 6-hour competitors were added to the course, I hallucinated at the aid station, seeing on the table two groups of numerous dots merging to the center. The thought of unexpectedly passing out intimidated me the most, but I also reminded myself with Whom I was running, that “I can do all things through Christ who strengthens me” (Philippians 4:13). “The greater the adversity, the greater the testimony,” thought I. 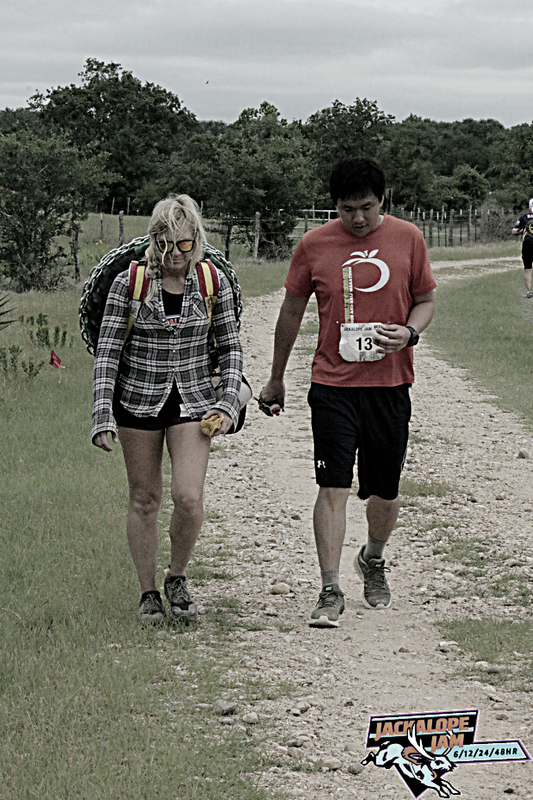 18 miles to the 100-mile buckle, delirium hit me again, and a Christian woman running in the 12-hour, unaware of my symptoms, told me to walk with her; God had already planned her entrance for me here. I could no longer run at this point, and I had been limping since mile 51. I asked her if ultrarunners commonly hallucinate, and she referred to a scientific study that proved the human brain becomes “fried” and reacts similarly to drunkenness after 68 miles. Around mile 87, Race Director Rob Goyen told me, “You are about to do something very special,” encouraging me to keep grinding through the pain. Runners passing me continued to comment, “You are amazing,” “You are an inspiration,” “You are still going!” and many more inspiring words, and their sincere longing for me to fulfill my dream, constantly asking me which mile I was on, warmed my heart. One Christian brother I shared the course with often towards the beginning even said about me, “I am more excited to see him finish his first 100 miles than for me to finish this race.” Both seeing and hearing numerous people become emotional for me, I cannot remember the last time I was surrounded by such a humble group of individuals so genuinely interested in other people’s success, in spite of how they themselves were doing. Ultrarunning humbles and builds character. On mile 91, I took a twenty-minute break, which recovered me enough for the next mile to feel less straining than the previous ten. 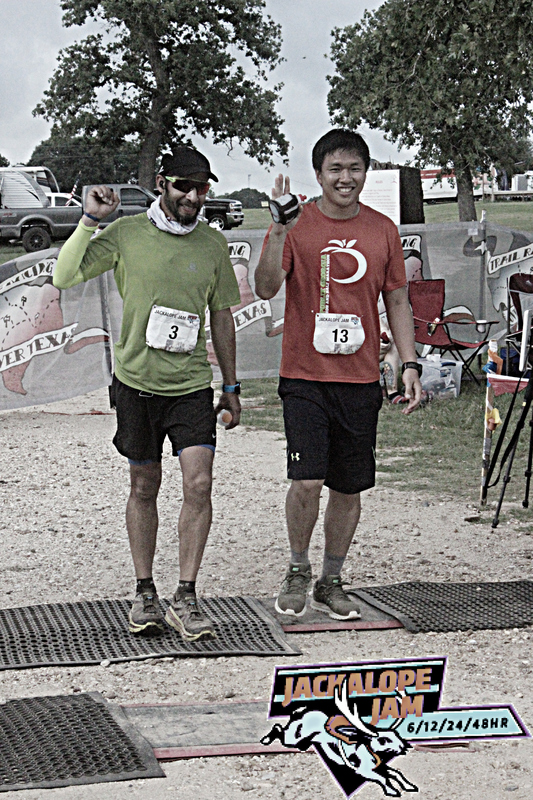 Another Christian man, not even running in the race, volunteered to “guarantee [I] receive that buckle” by walking the rest of the 100 miles with me; again, God had planned his entrance then for my upcoming hardship. On mile 94, moving with him, I became delusional again and occasionally threw out arbitrary phrases. 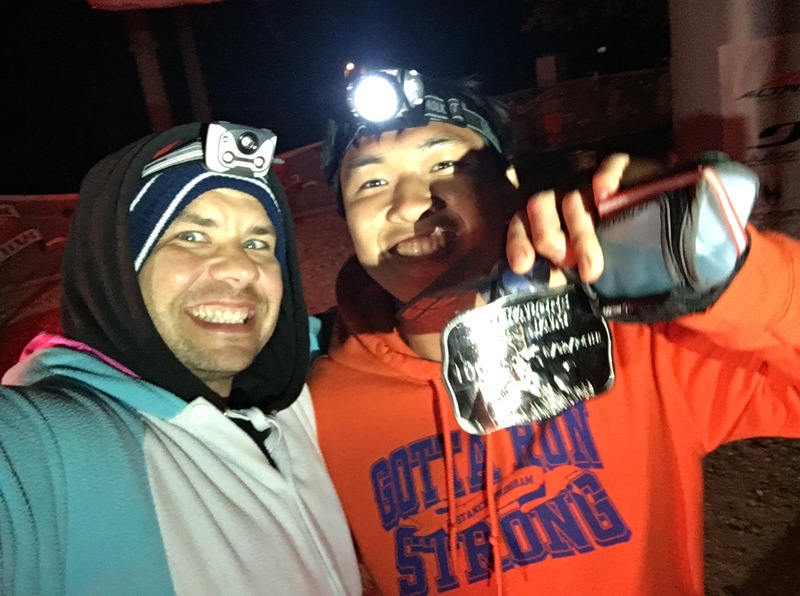 I even asked him, “Do I seem delirious?” to which he responded, “If you are asking that, that means you are.” On mile 95, I questioned myself, “Am I in a dream or is this really happening?” (On the bright side, while these symptoms lasted, the physical pain vastly escaped.) The pacer wanted me to complete mile 100 on my own so that I could reflect on this grueling journey, but at this point I was already out of my normal state of mind and had trouble comprehending I was on the verge of accomplishing a goal that felt like a fantasy for years. I envisioned breaking into tears receiving the buckle, but I did not even have the energy to cry at the buckle ceremony. (I was later told the race director stayed past his shift just so that he could present me with my buckle himself, which made me feel grateful beyond words.) Following, to test my absolute limit the Lord set before me, I covered two additional miles with a volunteer, making my total mileage 102 in 39:25:44 and me actually appreciate insomnia for once in my life. Throughout these two mornings, afternoons, and evenings, I felt not even a hint of injury, another visible showing of His protection considering my history with knee injuries in long-distance running. Garmin doesn’t work too well on trails. I divide the victory of this seemingly unconquerable adventure into three stages. 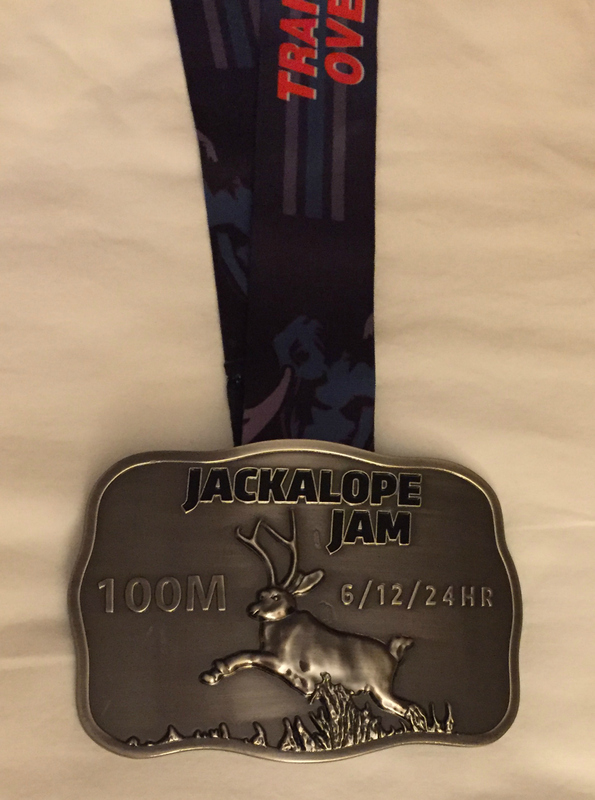 First, despite 99% of my close ones’ initial heavy opposition, I consistently prayed, believed God was leading me to 100 miles, and eventually registered for the Jackalope Jam. As my pastor Adrian Boykin said, “There is no failure in trying,” and, whether successful or not, my identity as a son of Christ does not change. Second, I had put my body through more than I ever have, cross-training between an hour and a half and three hours almost daily, covering up to 40 miles a week in addition to training on the elliptical, indoor bike, treadmill, and stairs, swimming, and technical muscle working. Even running back-to-back Friday half marathons and training in the sauna to prepare for the inevitable Texas heat at one point, I frequently felt verging on injuries but toed the line healthy. Third, I finally earned that buckle. A tremendous amount of prayers and support have come my way, all of which I felt more powerfully and realistically than ever, for my fantasy to materialize and I have countless people to thank, but I feel obligated to give one person, one of my faith mentors and mother’s best friends, in particular credit. The mentor told me to begin training half a year ago, that “If it is not meant to be, God will give [me] a sign.” Without this answer to my question, I would not have begun preparing for 100 miles and would still be thinking today, “What if?” Praying with her husband every day since, she even stayed up throughout my entire race of nearly 40 hours and fasted and prayed for me while tracking my performance on the live results page. Through my success, she and I, along with many others, have built a new powerful testimony to God’s greatness, that a person can overcome anything in Jesus and His will. On top of fulfilling my dream, I am truly thankful and honored to have met and befriended so many selfless and compassionate individuals, most of whom referred to me as “Nebraska(! ),” lending me seats to relax, checking on my torn body, cheering me on, and giving my simple smile too much value. I will cherish this experience my Father coauthored with me for the rest of my life.